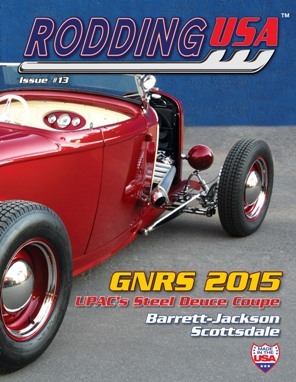 Rodding USA magazine's Issue #13 in stock and available to order now. Magazines ship next day. Issue#13 features a thicker and glossier cover while inside we bring you some of the best traditionally-styled hot rods in America. If you owned your own company making all-steel deuce bodies what style of hot rod would you build? We answer that very question with a masterpiece features on Brookville's new-look roadster and United Pacific's new 5-window coupe. We take a peek behind the garage doors at a '36 Ford coupe in the build and then step over the fence and back in time to a Colorado junkyard long forgotten. Then in an srticle with a twist, Editor Paul Martinez takes forward into the future for a look at a 3D printed car which is interesting and will have a hot rod connection. Our event coverage focusses on the huge Barett-Jackson auction and the fabulous Grand National Roadster Show. All that and more in our regular columns and features and don’t forget our growing list of dealers. Rodding USA, by hot rodders, for hot rodders.